You may have noticed a pattern lately. Bow gloves? Yeah. 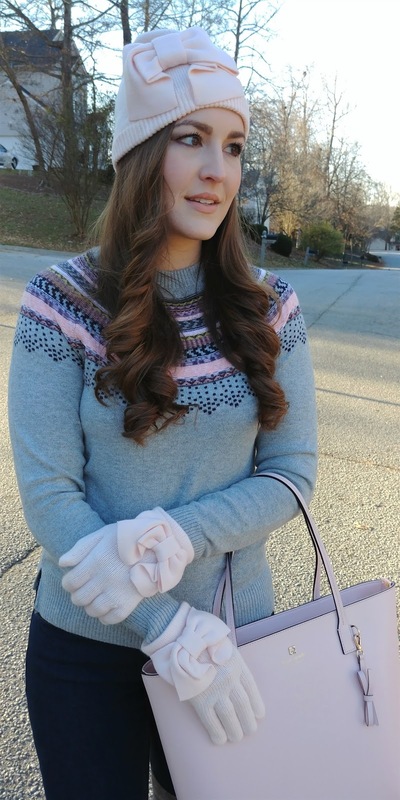 I got obsessed with bow gloves... and also, it got really really cold! So they were not only adorable, but very necessary! Fun trivia fact: If you just randomly type in "bow gloves" while shopping, like on Amazon, the algorithms will think you mean gloves to use with a bow and arrow. Not exactly my style! haha But not to worry. I clearly figured out how to shop my adorable gloves! I hope you're having just the most lovely day!! I'm so glad it's finally starting to warm back up. I love wearing my cute gloves and beanies, but I also love being able to feel my nose! haha. Oh my gosh I saw the same thing when I typed in bow gloves. Too funny! Totally makes sense! I love it too! This is such a beautiful, girly outfit. You remind me of Blair Waldorf. Love it! Thanks Amber! I get the Blair reference a lot, I love it! That is a such a cute beanie and gloves. Thank you Jane! Isn't it a sweet little design? I love it too! Such a cute outfit! OMG, that bag though! LOVE it! Kate Spade is definitely one of my favorites. I have a gold KS iPad case! Also, Yes, you are seriously channeling Blair Waldorf in these pics! Gorgeous! Aww, Thank you so much! One of my favorite bags for sure! That beanie is easily the cutest I've seen in a while. Lovely details on your sweater too dear. You always rock these pretty and girly look and You look so charming!